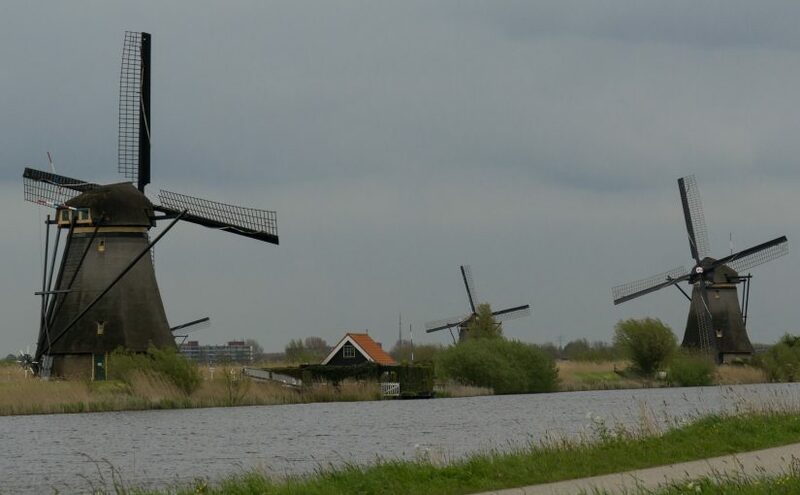 The Netherlands has been pumping water out of their low lying lands for hundreds of years. Large earthen structures were built and the land inside pumped for many years to remove the salt water and make the land sweet enough to grow crops. First salt tolerant crops were grown and after years of pumping, the very fertile land became sweet enough to grow the ultimate Netherlands crop: Tulips for export. Pumping evolved over time as the Dutch engineers became more expert in their huge task. The first very large scale pumps were the windmills. 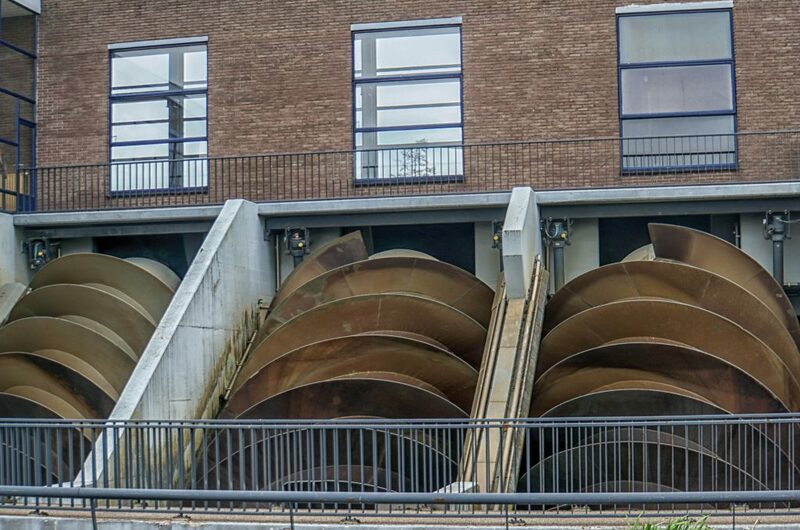 Made out of wood, these structures either lifted buckets of water to a higher lever or, more commonly, just splashed their paddle wheels into the lower level water and lifted it a few feet to the higher level. While they were not terrible efficient, the wind was ample and free and the windmills could be built by the available craftsman with available materials. The windmills, with their wooden gears and wooden bearings, were difficult to maintain and have been retired to serve as tourist artifacts. Factory-built turbo pumps are still in use today. In our cities, they pump nearly all the fresh water and most of the fluids we use. The Dutch pumps, on display at the Kinderdijk museum, were large cast iron devices hooked to large electric motors or Diesel engines. In about 200 B.C. Archimedes developed two significant ideas. He is best known for the principle, the idea that floats your boat. Mostly, he built siege instruments, devices used to attack cities. His most useful invention is the lesser known Archimedes Screw, shown below. This device, shaped like a gigantic corkscrew, it turned slowly to move water along its length, just as a corkscrew moves the cork. It is ideal for very large volumes of water that must be lifted a short distance, exactly what must be done in the Netherlands. These screws are turned at a moderate speed to lift a large volume of water very efficiently.